March 10th is daylight savings. That means more time to spend outdoors. Longer daylight and, yes you guessed it, spring cleaning! While you’re enjoying the few more hours outdoors, pick up a rake, clean up the fallen debris from winter storms and create a plan for keeping your yard clean and neat this season. If you love heading outside but can’t stand the sight of lawn equipment scattered about and the kid’s toys taking over what was once your oasis, then it’s time to think about investing in a portable shelter. The spring season is a great time to set up a portable garage because the ground is starting to soften and there’s still time to tidy things up before the summer barbecues and outdoor relaxing happens. Here are some tips for what you can store in the shelter and how. Pick a location in your yard that’s set back and utilize it to store lawn equipment and other clutter so it’s not out under the patio where you’re trying to relax. Not only will it be sheltered from the hard weather, but it will also be covered and less of an eyesore. You can also utilize a covered canopy to host parties and keep guests comfortable without the sun beaming down on them or the possibility of rain throwing a wrench in your plans. If you have toys that you don’t use all year round – like ATVs or snowmobiles and need somewhere to store them, a portable garage is an economical and great way to shelter them from the elements and keep them safe when not in use. Portable Garage Depot carries garage and carport products in a myriad of sizes from temporary or permanent all weather protection. Shop our inventory now! The winter months have covered much of the nation in cold blankets of snow. 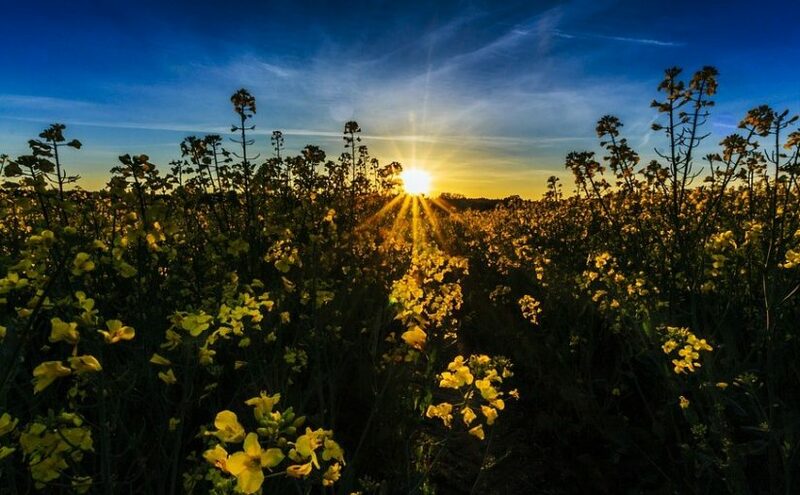 However, in less than 30 days, the first day of spring will be here and for many outdoor enthusiasts, it means getting the spring and summer toys ready to use. For boat lovers, taking them out of storage, cleaning and prepping them for the first outing on the water is an important early step in the season. With just 4 short weeks until the season rolls around for many, now’s the time to order a portable shelter for your boat. Easily set up the portable shelter in your yard and get to work. Protect your boat and get it in clean and working condition and keep it somewhere that you don’t have to worry about passing eyes, weather ruining the interiors and to keep you warm while you sneak outdoors to give it some updates even with the cold temps still hitting much of the nation. 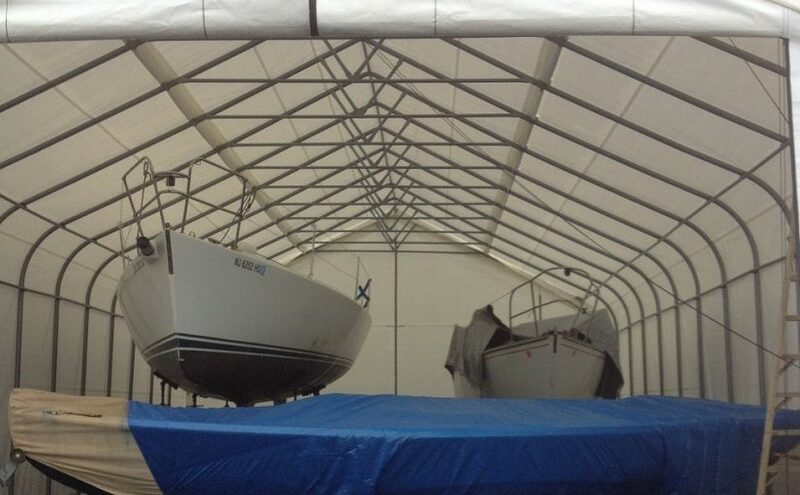 Shelters of America offers portable boat shelters made of high-grade steel frames and covers that attach to the frame. The triple-layer polyethylene and rip-stop fabric have fade blockers and anti-fungal agents so your shelter always looks great while protecting your boat. Keep it up for the season to place your boat when you return home after a day on the water and take it down when you no longer need it. That’s the beauty of portable shelters. The shelters can also be used for other storage needs, a covered area to have a party and more – the uses are versatile and endless. Shop our different sizes, shapes, and types on the site today! A portable garage is a simple and convenient solution when you need additional storage space but don’t have room in a traditional garage. Portable garages are designed to be durable, but in some cases, it’s better to choose a heavy-duty portable garage than a standard model. If you live in a region that tends to get winter storms that bring several inches or feet of snow and strong winds, a heavy-duty portable garage is a good investment. A typical portable garage might not be able to stand up to the weight of heavy snow and fierce winds. A heavy-duty portable shelter is made from stronger materials than standard versions. Most are constructed with steel that is chosen for its style and resistance to rust. Be sure to choose a garage with thick poles that are designed to withstand severe weather. A polyethylene or PVC cover can protect the garage’s contents from snow, as well as mold or mildew caused by moisture. If you are shopping for a portable garage, choose one that is the right size for whatever you want to store inside it. If you want to use your garage to shelter a vehicle, make sure you have enough room to open the doors and trunk. If you want to keep two vehicles in the garage, be sure that you have enough space to open the doors, walk around, and maneuver the vehicles in and out without too much trouble. Think about the layout of your property when choosing a portable garage. Make sure that you have enough space for the portable garage and a way to easily access it. Look for a level area that is free of trees, bushes, and other obstructions. Avoid choosing a portable garage that would make your yard feel cramped. Even if a garage would fit, squeezing it into a tight area could make the yard seem smaller and could prevent you from using it for other purposes. You might want to add sidewalls to your portable garage to keep snow out and provide additional protection for your vehicle or other belongings. 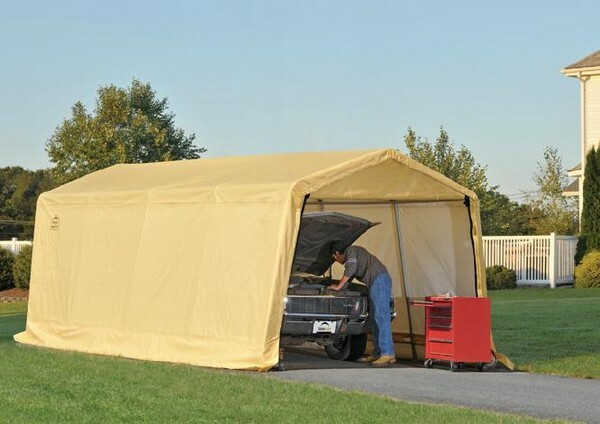 If you want to include sidewalls, make sure the portable garage you choose is compatible. Be sure to anchor your portable garage securely to the ground to keep it from blowing away in heavy winds. Choose anchors that are designed for the type of surface where you plan to set up your shelter. 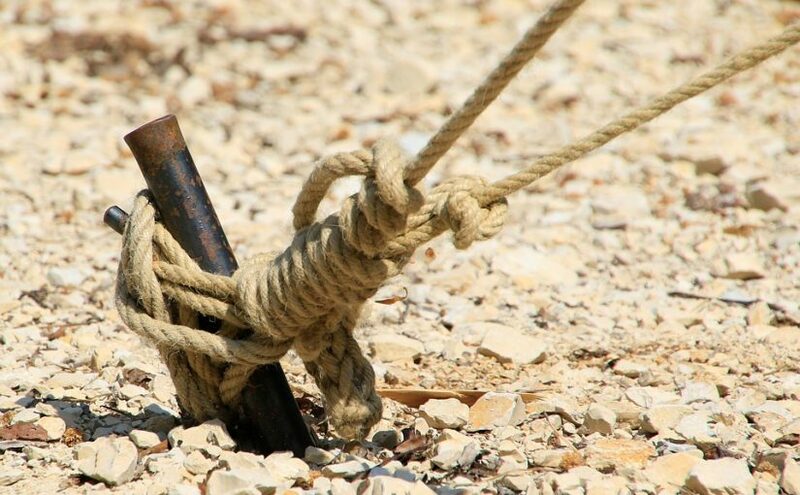 Anchors are made for soil, sand, cement, or concrete. Portable Garage Depot has a wide selection of shelters that can protect your vehicle or other prized possessions from the elements. If you live in a region that experiences harsh winter weather, choose a heavy-duty garage to keep your belongings safe. Look through our inventory and place your order today. Depending on where you live in the nation you may currently be dealing with some intense winter weather. If the cold season is just beginning for you, then you likely have winter precautions on the mind. Along with cold temps and fierce winds, snow storm brings in the potential for ice, flying debris and heavy layers of precipitation – all of which can do serious damage to property. If you own a portable garage to help you keep the valuables in your yard protected it’s important to pay attention to heavy loads and use proper skills when setting up the portable garage to ensure it can withstand winter weather. Check out these tips for keeping your portable garage sturdy this winter. If you live in an area that’s hit pretty severely by winter weather, it makes sense to purchase a portable garage that’s designed specifically with withstand snow rain and heavy loads. A round or barn-style portable garage for example, is a good choice because it allows for snow to slide more easily off the roof. The fabric and materials used are also important. Don’t skimp and purchase the lowest price portable garage if you know it’s going to be doing some work in the winter. 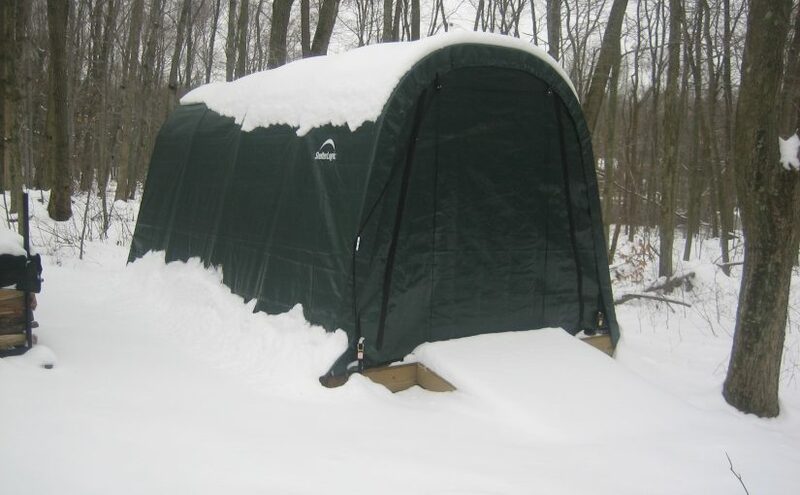 Choose a portable garage made to handle the elements so that it won’t collapse under the weight of a heavy snow storm. You might be setting your portable garage up in the summer months and not thinking about snow, but if you don’t plan to take it down and move it later on in the season, then you’ll want to think about it as you’re planning the location and method of installation. Don’t wait until the ground is frozen to try an anchor it into the ground and be sure you have the appropriate permits if required by your town. Shop our huge selection of portable garages now! Replacement Covers: Don’t Wait Until it’s Too Late! Portable garages are great for so many reasons: They’re affordable, versatile, easy to move and they don’t require you to break ground and build a permanent structure to get protected storage. Even with long-lasting polyethylene covers that resist tears, over time, it’s inevitable that normal wear will compromise the integrity of the cover. Here’s why it make sense to get a replacement cover even if you don’t have a tear. Outside of normal weathering, Mother Nature could also bring a nasty, windy storm and a branch from a tree could hypothetically come ripping through the cover. Be prepared for these situations by buying a replacement cover in advance of any issues and storing it away for safe keeping. It’s easy to take down an old, worn cover and simply put the new cover on in the same positioning. You’ll want to also take inventory of the frame and other parts to ensure they’re still in working order as well. Then the only thing you have to do is keep a regular eye on your portable garage going forward to guarantee its longevity. You can also consider a different style cover when you order a replacement. If it’s made to fit your style frame, you may want to consider a zip-up door or a cover that’s made to last longer – the options are endless. 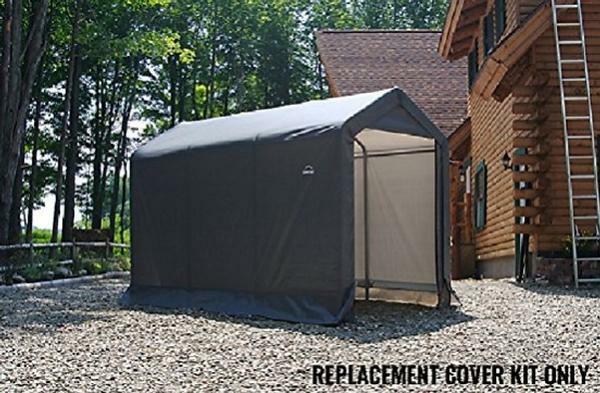 At Portable Garage Depot, we offer a selection of replacement cover options for your dwelling. 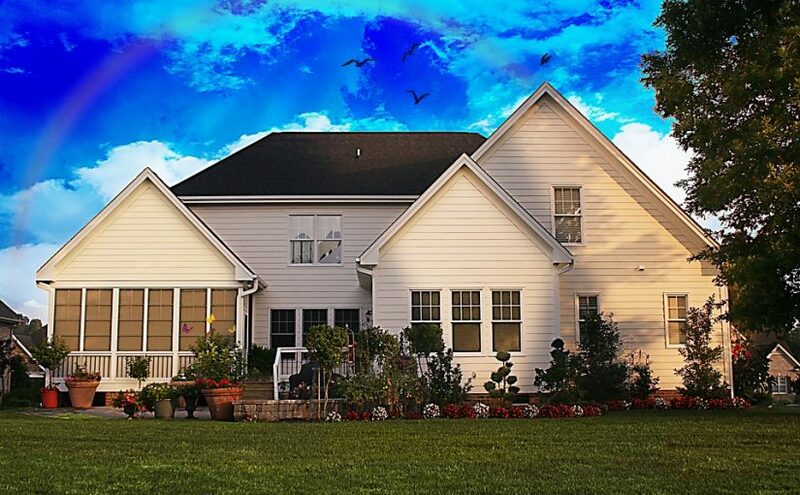 From a multitude of sizes and style selections, our goal is to help you keep your property protected. 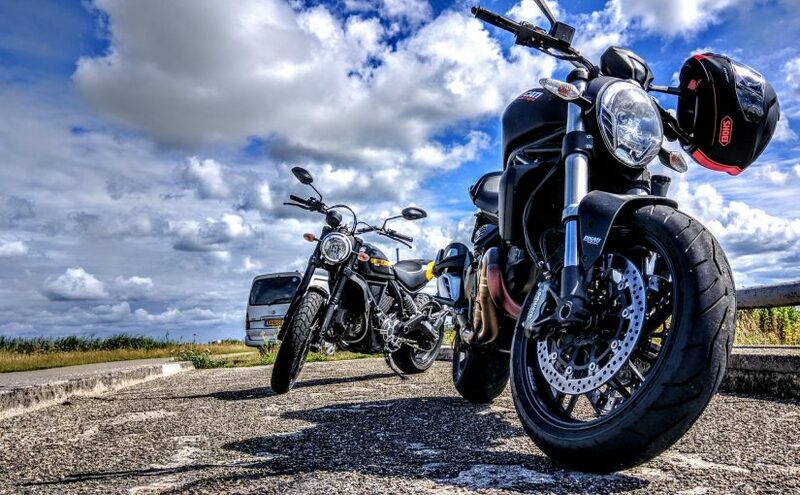 Get instant, convenient year-round storage and protection for cars, trucks, ATV, motorcycles, boats, equipment and much more. If you’ve been thinking about surprising your friend or family member with a portable garage this holiday season, then congratulations: you’ve settled on a gift that is very hard to top! As it is with most gift purchases, it’s important that you select a portable garage that fits the needs of the person you want to buy it for. For example, you probably shouldn’t buy a portable shed for someone who would get more value out of a portable greenhouse. Consider all the options before you buy. If you’re a little confused about which portable garage to get, don’t worry–we’re here to help! Here are 3 tips to help you choose a portable garage to gift to your loved one this holiday season. Before you even start browsing, think about what it is that this person needs to house. Do they need to protect their car from the elements? Do they have a boat? An impressive collection of tools? Livestock or animals that they want to keep safe? Maybe they throw parties often. Think: do their guests need shelter from unexpected storms? If you’ve answered ‘yes’ to at least one of these questions, then you’re off to a good start. If your friend has a boat, then you should be looking at boat shelters. If they have amassed lots of tools, then a portable shed would be ideal. If they have goats or outside cats, then look at portable animal shelters. Get the idea? Good. Now let’s dive a little deeper. 2. Consider Size: How Much Space Do They Have? Nobody wants to hear that their gift was returned because the recipient didn’t actually have space for it. Be strategic in your approach. If you want to keep this a secret, realize that you don’t have to keep everyone in the dark. For instance, if the gift is for your best friend, then ask their spouse, roommate, or parent to get ballpark measurements of the space you have in mind for it. Most portable garages are composed of steel frames. As you browse and compare shelters, consider the diameter of the steel frame. Generally, the thicker the diameter, the sturdier the shelter will be; the drawback, however, is that thicker frames tend to command higher price tags, and are more difficult to transport. If you decided on a portable shed, for example, then chances are that the recipient will not need to transport it often, so it may be beneficial to opt for the more structurally sound option. 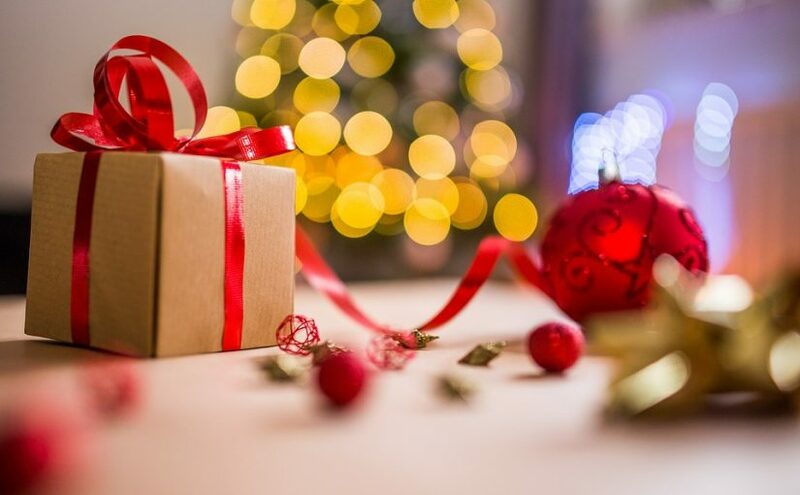 Now that you have the knowledge needed to pick the best portable garage for your friend or family member, check out what Portable Garage Depot has to offer for your holiday gift checklist!